UDM Downloads > Tipard iPhone Manager for SMS! Tipard iPhone Manager for SMS is the valuable iPhone SMS Manager for you to copy, backup and manage iPhone SMS to avoid the SMS missing or the full SMS box before iPhone reject receiving new SMS. You can directly copy iPhone SMS to computer as .txt files without any loss. Backup current iPhone SMS to local defaulted folder. 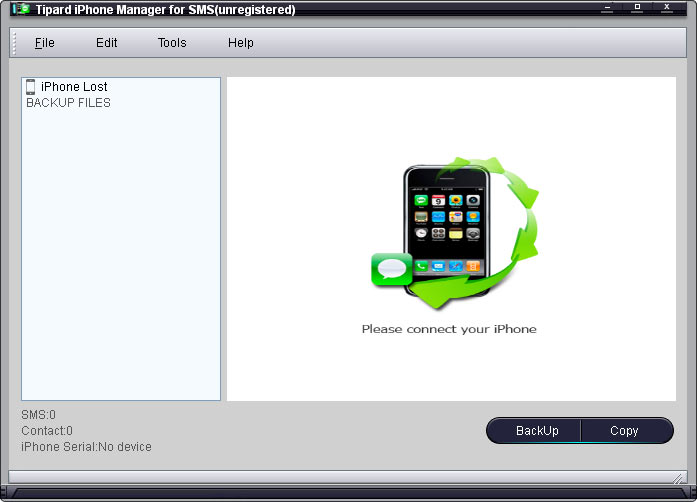 Moreover, with this iPhone SMS Manager, you can delete your selected messages that you do not need on the backup files. You can define the specific path for the copied files. The backup files can be input in the defaulted folder automatically. Key Functions: 1. Copy iPhone SMS files to local disk You can directly copy all the SMS or just choose the specific message of the specific contact. 2. Backup current SMS to computer You can backup all the SMS on the iPhone device at the time at the default folder. 3. Delete the SMS on the backup files Directly all the SMS or your selected SMS that you do not need on the backup files.